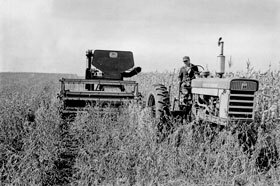 Clarence Van Sant, who farms 135 acres of rolling land in central Iowa, has never put much stock in the advice of economists who insist farmers have to keep getting bigger to make it. Nor has he accepted the suggestions from his land grant university and others that you have to apply a wide range of farm chemicals and use medicated feeds to get good crop yields and produce healthy livestock and poultry. Van San switched to organic farming in the early 1960s, building up his soil by rotating crops and practicing good conservation. The result is a family-type farm that is sufficient, profitable, and ecologically sound. The marketing problems faced by many organic farmers also was overcome two years ago when Van Sant and his wife opened a health food store in nearby Grinnell. Their full line of organic foods includes eggs, whole wheat flour, pork, sweet corn, and edible soybeans produced without chemicals on their own farm. The farm looks and sounds like the family-type units that dominated the Iowa scene in years back. A farm dog announces your arrival, half-grown pigs look up from a cool mud bath, hens sing in the chicken house, and a lonely Charolais bull rattles the sides of his reinforced pen. Attendance at an organic farming meeting challenged Van Sant’s thinking and convinced him he should consider giving up chemicals. He was most impressed, he says, with statements regarding the buildup of earthworms on organic farms and the part their castings play in developing topsoil. He said he also had become concerned about the continued use of chemicals when a sample taken from the well on the farm showed a nitrate level well over the danger line. The water was being used for both family and livestock purposes. Van Sant make the final decision to try the organic method after attending more meetings and learning all he could about it. Farming organically meant, among other changes, switching to the chisel plow. Van Sant purchased an eight-foot model and pulls it with a 460 Farmall tractor. Van Sant has two crop rotation plans going on the farm–one for the good ground on the ridges and one for the hillsides where soil erosion is a continuing problem. He uses a three-year oats-hay-corn rotation on the hilly ground. Soybeans follow hay on the better fields in a four-year plan that includes oats, hay, soybeans, and corn. Van Sant gets good corn and soybeans yields with this rotation. His soybeans have been running around 45 bushels an acre, well above the average in his area. Van Sant says the answer to the weed problem, in addition to crop rotation, is timing. That means getting into corn and soybean fields with a rotary hoe to tear up the weeds when they’re small, then with a cultivator to cut off and cover those that are left. Spring wheat is substituted for oats in the rotation on some fields to provide grain for the whole wheat flour that is a popular item at the store. Wheat normally isn’t grown in central Iowa, but Van Sant’s has made up to 40 bushels an acre. Hay in a rotation also is important for a livestock-grain operation that is nearly self-sufficient. Van Sant has about 30 stock cows and calves on permanent pasture during the summer and it takes a lot of hay to get them through the winter months. He gets three cuttings of red clover and alfalfa hay, which is baled and stored in the barn. Normally this yields 3,000 to 4,000 bales of the clover-alfalfa mixture. The hay is fed to the cattle in the field until the snow gets deep. Van Sant said this keeps the manure from accumulating in barn lots during winter months when it is difficult to spread it on the land. Van Sant is proud of his purebred Charolais herd, which provides a profitable calf crop each year. He sold most of the calves as feeders last December, a sound decision because cattle prices fell a short time later. The calves usually weigh about 500 pounds when winter sets in. 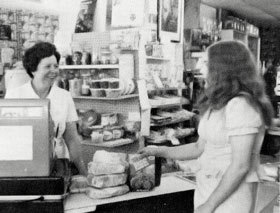 The Van Sants had no idea an organic food store was in their future when they changed farming methods. It all started when they were attending a series of meetings in Mason City, Iowa, and started bringing organic food home for themselves and others who had tried it and liked it. This has become Van’s Health Foods, a well-stocked store on U.S. 6 near the Grinnell College campus. Customers who had come to the farm for organic foods or who had been on Van Sant’s fresh egg route in town made it an immediate success. The store also provides an outlet for Van Sant’s hogs, which are lean and meaty and are fed out without antibiotics on organically-grown grain. They have to be butchered at a local locker plant to satisfy state and federal requirements. Customers place orders for a half or a whole hog at a time. The Van Sants note that meat, eggs, and other products raised on their organic farm are priced lower than similar items purchased at the supermarket.